Number Now is the solution for creating numbering files for any type of invoice, ticket or document. While layout programs have dramatically improved their support for creating merged documents, there hasn’t been an easier way to generate numbering files themselves. For years designers have opened a spreadsheet, dragged a column, and waited for the cells to auto populate. For long numbering documents this can take minutes. In addition to being slow and monotonous, this method is also very inflexible. Designers don’t want to deal with formatting cells and managing spreadsheets. Number Now has been totally redesigned to be blazing fast. Compared to previous versions, Number Now 4.0 is over 100% faster, and over 200% faster in large files (>100,000 numbers). A simplified interface makes it even faster to generate the numbering files you need. To increase your available options, Number Now also allows you to enable zero padding (001 instead of 1) with one click. We have improved PreCursor, which now allows you to add characters before or after your numbering (E001 instead of 0001). Number Now can also automatically open files in the Finder after creation, and new menu items allow you to control all options and built in presets with mouse or keyboard commands. Number Now 4.0 introduces support for Dark Mode in macOS Mojave and includes bug fixes. This builds upon the previous update which introduced a redesigned preference panel, TouchBar support for 2016/2017 MacBook Pros, the ability to set up to five custom presets, progress indicators on large numbering operations, built in help and more keyboard shortcuts. 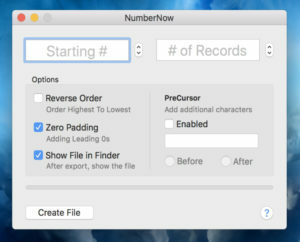 For designers who frequently create numbered documents for clients, Number Now can drastically reduce the amount of time you spend in spreadsheets and give you more time to spend creating. Number Now 4.0 is now available as a FREE update. If you haven’t yet tried Number Now it is available for only $1.99 on the Mac App Store.